As it is said….all good things must come to an end. I will not be releasing any more Prairie Women's Sewing Circle Journey patterns. The natural cycle in the quilting business is all about "what's new", and it's time to move on to a new adventure. 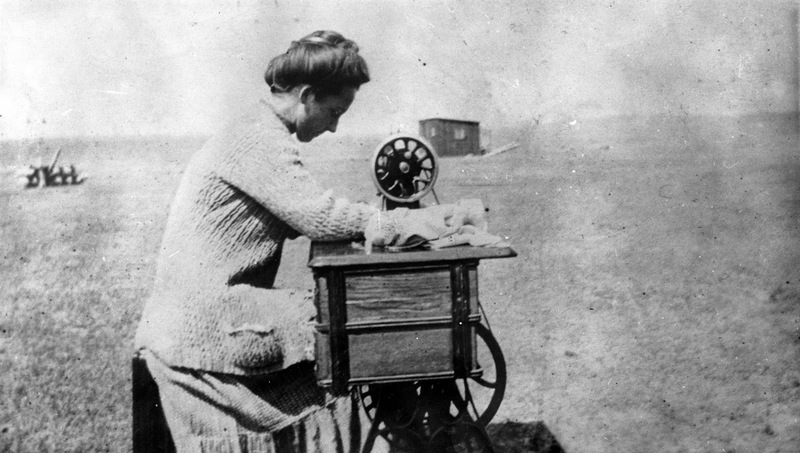 I have thoroughly enjoyed every moment of creating the PWSC club, and it has brought me the opportunity to meet many, many wonderful quilt shop owners, and so many thousands of gracious, talented quilters who have all shared my love of nineteenth century living, antique quilts, and our make-do heritage. I am forever grateful for all of the sharing between our kindred spirits! There is so much to look forward to in the future with new and exciting opportunities. My creative soul will always be anchored in the nineteenth century, and I will continue to look for ways to incorporate American history into future projects. My Prairie Gathering Quilt of theQuarter program has four historical stories of how women "gathered" together to bring lasting change in our country. Click here to find a quilt shop near you offering the Prairie Gathering program. 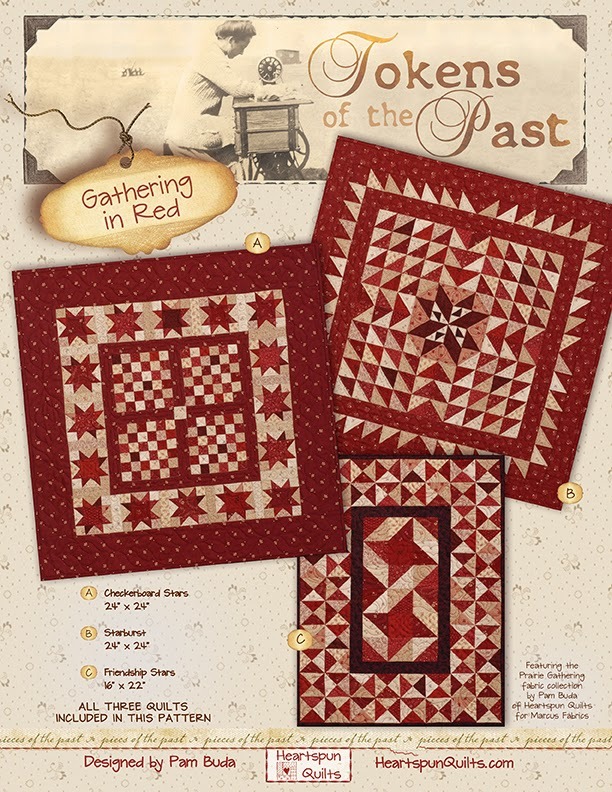 Then, there's my new pattern series, "Tokens of the Past", with Gathering In Red as the first in the series, which continues with Civil War reproduction doll size quilts that are very do-able, affordable projects that give you the option of using my new 10 inch Prairie Gathering precuts from Marcus Fabrics or choosing your own fabrics. And, I am happy to continue creating new and exciting things for your quilting pleasure! Prairie Women's Sewing Circle Journey patterns will continue to be available to quilt shops that are continuing with club meetings. Thank you so much for your support of the Prairie Women's Sewing Circle club. It's been a wonderful journey!!! Last weekend, I had the pleasure of visiting The Country Loft in La Mesa, CA. Oh, yes...what a hardship for this Chicago girl to spend time in the San Diego area in January! Friday, Saturday and Sunday I taught workshops and spent the day with wonderful quilters!! Many attending have been Facebook friends! Always fun to meet them in person! And much to my surprise and delight, designers Cheri Payne (Quilts by Cheri) and Kathy Cardiff (The Cottage at Cardiff Farms) attended Sunday's class. Lucky me because I don't get to see them very often. I so look forward to giving workshops because I maintain there is just no better way to spend a day than with quilters!! Everyone was so friendly, and happy to be sewing. Shop owner, Sharon Smith, had the workshop in the banquet room of a nearby local Italian restaurant. As you can see, the room was bright and sunny....and the food...oh...the food was wonderful!!! The only thing that would have made it any better was if I were sewing, too!! You'll find no complaints from me as I had the best time!! Every chance we had, we went across the street to shop at The Country Loft. Let me show you why!! If you love Civil War repros, wool, antiques, folk art and country decorating, you simply must visit The Country Loft!! ...beautiful cottons and inspiration everywhere!! Don't they have great ideas for displaying quilts?!! Like this display of all five of the Prairie Women's Sewing Circle Journey quilts! WOW!! I absolutely loved seeing my Prairie Gathering Quilt of the Quarter displayed on a bed in the shop! So cute with the ticking pillows and bed skirt. Would love to take home some of the antique furniture, too!! Sharon and all the very creative shop girls pay attention to even the smallest things, making them so cute and adding inspiration everywhere!! And...if all that didn't tempt you, they have more antiques in the little cottage in the back yard. Sigh....it's all so much fun, it was very hard to leave!! My heartfelt thanks to Sharon Smith for asking me to visit her wonderful shop. To all the shop girls who made delicious treats Friday night, and who work so hard with Sharon to make a beautiful and inspiring place for all of us to enjoy, and feed our creative souls. And, last but certainly not least...to all of the wonderful ladies who attended the three workshop events....I thoroughly enjoyed meeting each and every one of you. Your warm welcome will get me thru the rest of my Chicago winter!! For the many quilters piecing my Prairie Gathering Quilt of the Quarter quilt, I wanted to write a blog post once a month to go over any piecing tips I may have to help you while you're piecing the quilt for yourself. If you're not making the Prairie Gathering quilt, perhaps you can pick up a pointer or two anyway!! Soon, we will be making many parts of the quilt each month. Included in your pattern pack are Zip-loc bag labels for keeping all those parts organized. I'm organized to a fault, so I'm taking you right along with me! The single most important tip I can give you in making this quilt (or any other, for that matter) is measure, measure, measure!!!!!!!! The success of everything fitting properly in this quilt is totally dependent on all units, blocks and borders measuring exactly what they need to measure to fit. Measuring at each step of construction is so very, very important no matter what you're making. while the seam you have to rip is small!! All of my patterns list the measurements during construction so you can be sure you're on track. Follow the measurements given in your Prairie Gathering pattern, and don't proceed until your patchwork measures what it should! I guarantee this will make you a better, more accurate piecer, not to mention you'll be absolutely delighted with the results!! The first step is to make a Nine Patch block...easy enough, and always a favorite. Then, you'll surround your Nine patch with (4) light triangles. My hint to centering the triangles on the Nine Patch is to fold the Nine Patch in half, wrong sides together. Finger press a crease into the top edge. Take a light triangle and fold it in half, right sides together, and finger press a crease. Now, bring both units right sides together, match the creases and pin. Perfectly centered every time! Sew and repeat for the other triangles. Those light triangles might look like they won't fit, but trust me, they do. Next step...add (4) red triangles. Repeat the finger press creasing to center the red triangles as well. Make your assorted Half Square Triangles ...again measuring them to be sure they are perfect. You have (4) assorted red prints, and one really dark red print to work with. Obviously, the darkest one is positioned in the corners. For the (4) assorted reds, use one red in the same position all around the sides of the block. That way, a print will never be next to itself. Sew the HST's into rows for the sides, then sew to the center block. Did you measure?? Sew the top and bottom rows, then sew to the block. The block is all done and looking great! Place all of your cut pieces into their respective bags and zip them up until next month. If you like what you see and want to make A Prairie Gathering for yourself, click here to find a list of quilt shops offering the program and sign up! Treenware & Berries Coming Soon!! Any day now, the sample fabric of my newest collection for Marcus Fabrics, Treenware & Berries, will arrive on my doorstep. As much as I've anxiously awaited its arrival, it's just my luck that it's coming now that I'm out of town!! 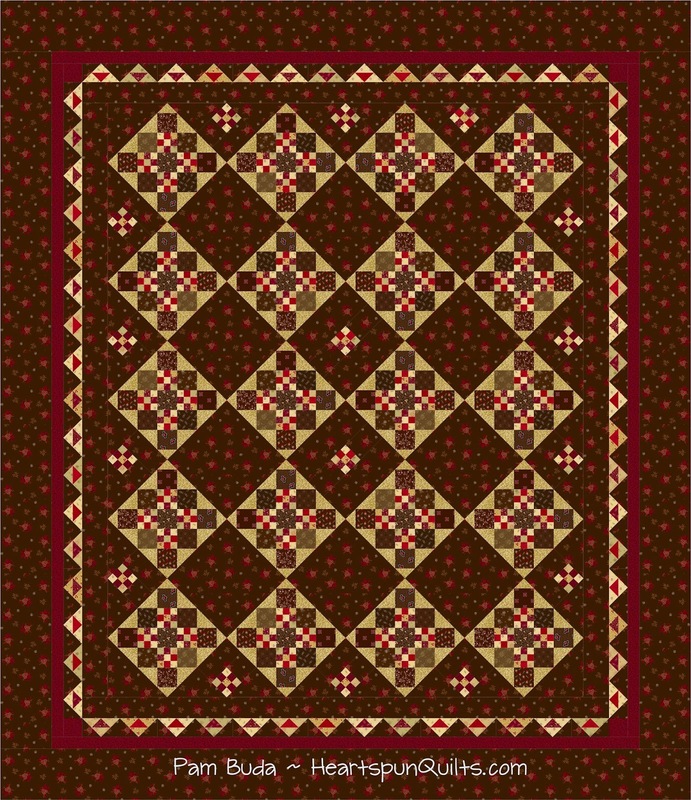 I wanted to share at least the EQ image of the quilt I've designed using this warm and toasty assortment of yummy browns, berry reds, and creamy light fabrics. 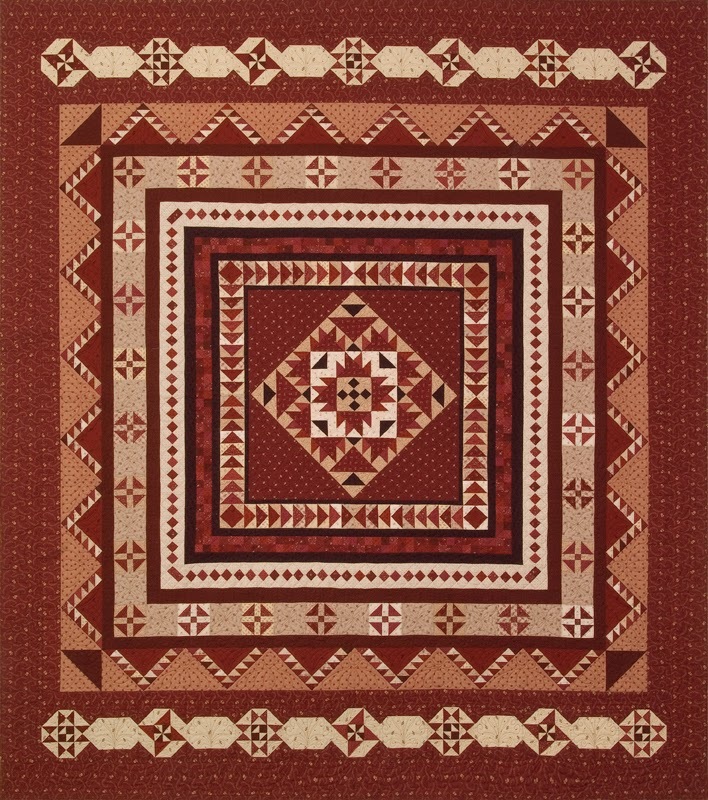 The quilt pattern is also called Treenware & Berries. I can hardly wait to begin!! Don't we all feel that way about a new project?!! You really have to take a look at all of the prints. Click here to go to the Marcus Fabrics website and see them all. In addition, I've asked for Marcus to make up 10 inch precuts of the Treenware & Berries collection. Yay! They said sure!! So, I've designed three awesome and irresistable doll sized quilts (I say that oh-so-humbly!!) using the Treenware & Berries precut. I promise to show you pictures when I'm making the quilts! Doing a happy dance!! Sunny & Warm California, Here I Come! Tomorrow morning (at O'Dark Thirty!) I'll be headed to warm and sunny Southern California!! My quilts are already there enjoying the warmth and the wonderful, cozy, and primitive surroundings of The Country Loft Quilt Shop in La Mesa, CA. On a normal day, I can hardly wait to visit this quilt shop....today, even more so as this morning here in frozen Chicagoland, it's -7 degrees...minus 7!!!! Ugh...Brrr...groan. I've been periodically traveling to CA nearly my whole life as I have very special relatives that live there. We have such a good time when we're together. I'll be staying with them and enjoying a few days of vacation....catching up, visiting, and seeing how big the little ones have grown. On Friday, January 16th, Saturday the 17th, and Sunday the 18th, I'll be commuting to teach classes at The Country Loft. How fun will that be?? Waaaaayyy FUN. I would love for you to join the fun, too!!! Click here to see the classes I'm teaching. We have just a few openings left, so if you've been thinking about coming to the workshops...well...come on! It will be a great time and you'll learn lots of good info, too. Not to mention.....you'll be at The Country Loft Quilt Shop!!! I won't be blogging about my trip there until I return home, but you can follow me daily on Instagram and Facebook. In the meantime, since most of the country is in the deep freeze like it is here, I hope you stay cozy, and get some time to snuggled beneath a quilt and stitch. That sounds like a mighty fine day, too! !